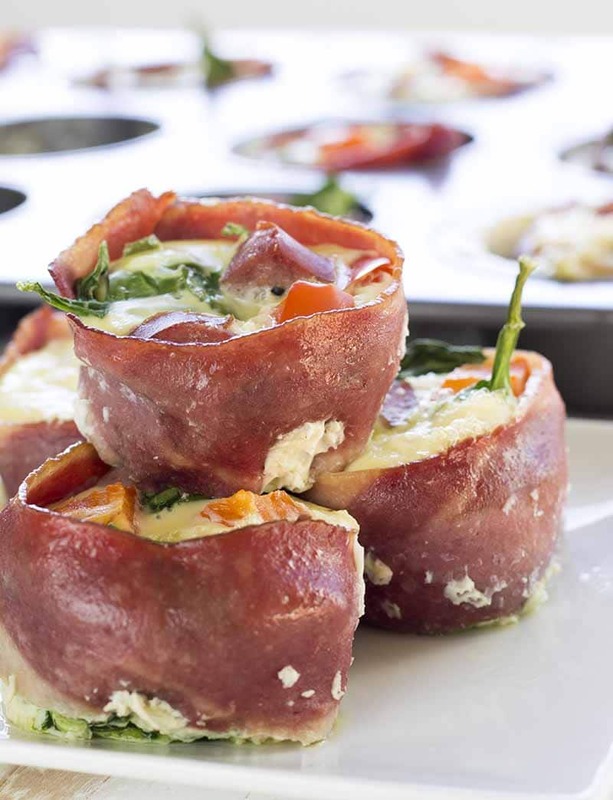 These healthy egg muffins with turkey bacon take hardly any effort to make, taste amazing, and can be stored and reheated the next day. What more could you wish for in a recipe? 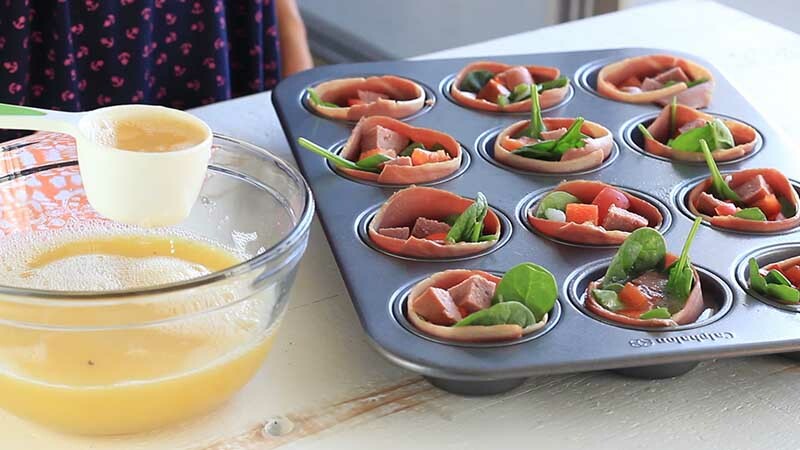 I originally made these little “turkey bacon egg cups” for breakfast, but they are quickly becoming one of my favorite snacks as well. IWe used to always bring a bag of hard-boiled eggs if I was traveling or going on a long road trip, but now I just bring a few egg muffins instead. Don’t get me wrong, I do enjoy my hard-boiled eggs, but the addition of vegetables and turkey bacon just takes the flavors to a whole new level. Step 1: Coat the muffin pan with a little oil or cooking spray. This will make it MUCH easier to get the egg muffins out of the pan. 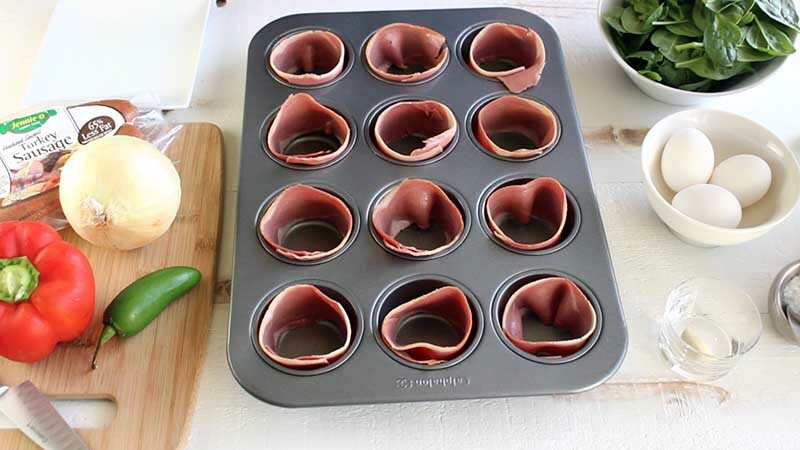 Step 2: Place a piece of turkey bacon around the inside of each muffin form. The turkey bacon also adds that little bit of extra saltiness that eggs need, so I always include it. Good turkey bacon is relatively low in fat and high in protein, so it’s perfectly fine for a healthy fitness recipe. Step 3: Chop onions, jalapeno, and garlic finely and sauté for a few minutes until the onions are translucent. Place in the muffin forms along with a bit of spinach, bell pepper, and small pieces of turkey sausage. Step 4: Whisk together eggs, egg whites, salt, and pepper. Pour the egg mixture into each form so it just covers the veggies. Step 5: Bake for 25 minutes at 350 F (175 C). That’s it! The egg muffins are ready in about 35 if you are fast at chopping veggies. A full muffin pan makes 12 servings so this is a great recipe if you are making brunch for a group of friends. The egg muffins also taste great reheated, so you can make them the day before if you want to save time in the morning. They can keep in the fridge for 3-4 days in an air-tight container. 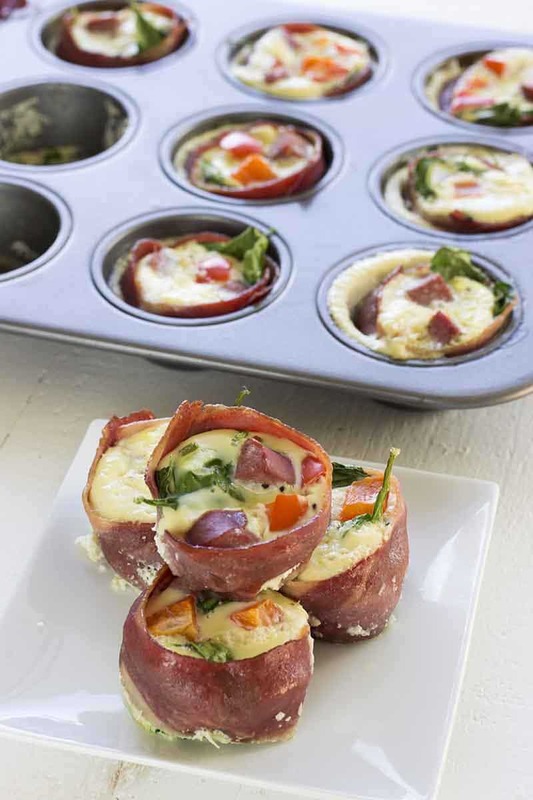 These healthy egg muffins with turkey bacon are really all you need for a healthy breakfast. But why not add a few more items for the perfect Sunday brunch? 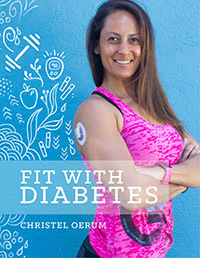 I love to start my mornings with Egg Muffins, Cottage Cheese Pancakes, and perhaps a High-Protein Raspberry & Banana Mousse. If I really want to go all-out, I include a Smoked Salmon & Cream Cheese Wrap as well. That’s a healthy breakfast or brunch you won’t find any better at a fancy hotel! For more recipe inspiration, you can also check out my list of the best low-carb breakfast ideas. I always keep that post updated with new healthy breakfast recipes. 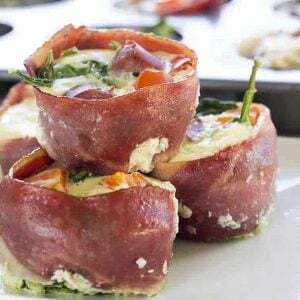 When you’ve tried these Healthy Egg Muffins with Turkey Bacon, please don’t forget to let me know how you liked them and rate the recipe in the comments below! I just prepared these muffins and have them in the oven. Very excited to see how they will turn out. 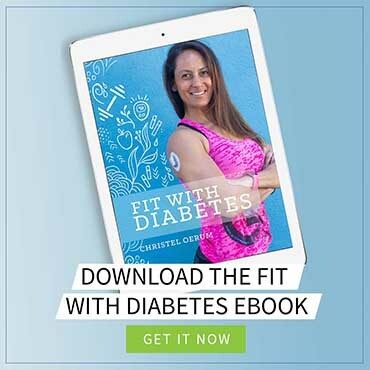 I’ve recently been diagnosed with type 2 diabetes and am struggling to find recipes that I would actually enjoy so I was very pleased when I spotted this one. Hi, I was wondering since I am on a diet should I eat 1 or 2 muffins in the morning? How many to consume will depend on your calorie need. One muffin is only 88 calories and will not be enough for most people. Does the bacon get crispy? If not, is there a way to make it so? It doesn’t get crispy, just firm. I don’t think there is a way to make it crispy in the muffin forms :-(. I prefer to use whole eggs instead of egg whites. How many eggs would you recommend for the 500g? Looking forward to a great weekend breakfast with this tasty recipe! I haven’t tried making it with whole eggs. But according to my research, a large egg white is about 30 grams, so that would add up to 16-17 eggs. You could also start with one egg per muffin, that might be easier. Just note that when you switch from egg whites to whole eggs the macronutrients per muffin also changes. These look amazing! Have you ever tried freezing them? I’m just thinking about meal prepping breakfast for easy grab and pop in the oven and go, but I didn’t know how they would reheat. First of all thanks for all the great recipies and for overall inspiration that you share. I made these yummi egg muffins yesterday, but today I’m left with a baking rack that takes forever to clean even though it has been left soaking in water all day. I did remember to spray with oil before pouring in the other ingredients. But what went wrong? I use a non-stick muffin baking tray, but yes it takes a little effort to clean. You can try and add paper or silicone muffin forms to the tray, but I haven’t tried that so not 100% on how that will turn out.